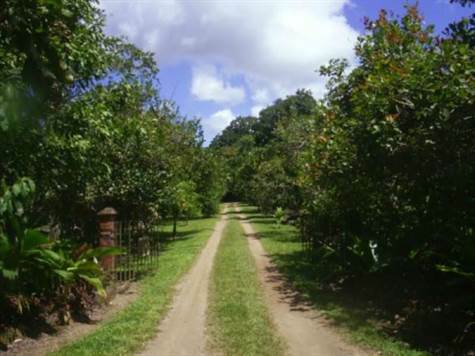 This 287 hectares and 4081.37 square meters property is nestled in the South Pacific province of Puntarenas, Costa Rica. This area has some of the richest marine and terrestrial ecosystems in the world. There is an annual rain precipitation count of 3500 millimeters. Therefore, this is a very intense rainforest area. Forty hectares are located in the Ciudad Cortes County and 247 are located in Palmar Norte County. The farm has 2 kilometer edge with the canal of the Terraba River (second biggest river in Costa Rica). In these canals, a great diversity of animal species can be found. This property has a front of 500 linear meters on both sides of the Costanera highway. This gives it a high value for capital gain. This gives those 5 hectares the possibility to be urbanized. This property also has archeological value. During the pre- Columbian time, a native group called Bruncas habited in this area. Still today, not far from Palmar Norte we have the indigenous reserves of Boruca and Curre. The property is located only 200 meters away from the Ciudad Cortes new hospital. This property is located nearby Ciudad Cortes. It is a 10 min drive from Palmar Norte. It can be reached very easily by airplane or by car. If you choose to fly, it is only a 45 minute flight form The Juan Santa Maria Airport to the Palmar Sur airport (10 minutes away from the property). If you go by car it is a 4 ½ hour drive from San Jose thru the Inter American Highway. Some of the near by attractions are: Dominical Beach (45 minute car ride), Uvita beach ( 5 minute drive), Sierpe River (20 minute car ride) and from here it is 1 ½ hour boat ride to the Cano Island a protected National Park with a very rich marine ecosystem… great to snorkel, scuba dive or just relax playing beach ball.